The company increases the payload and throughput on its easy-to-use, low cost T-series, and unveils a high precision force guidance system for parts placement. Manufacturers are looking for new ways to automate tasks in the factory without adding too much cost or complexity. With ease of use and added capabilities in mind, Epson Robots rolled out a new model in its T-series line of SCARA robots, as well as a force control guidance system for high precision parts placement. 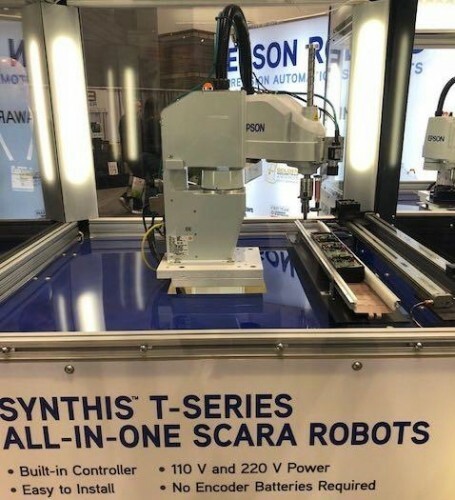 First, the Synthis T6 SCARA robot, announced this week at PACK EXPO International, is ideal for simple applications such as pick and place, assembly, parts handling and dispensing applications in industries ranging from automotive and medical development to lab automation, consumer electronics, electronic components and industrial. The design includes a built-in controller housed in the robot base and power for end-of-arm tooling. It runs at 110V or 220V and requires no encoder battery, minimizing factory downtime for maintenance. The biggest differences between the T6 and its predecessor, the T3—announced at PACK EXPO Las Vegas last year,is the payload and reach. The T3 has a payload of up to 3 kg while the T6 can handle payloads of up to 6 kg, and it has an extended reach of up to 600 mm. In addition, the T6 includes multi-headed tooling, which means more throughput. This is all delivered for under $10,000 as an alternative to expensive and complex slide-based offerings. The T6, which is available now, is priced at$9,495. It installs in minutes and virtually eliminates any space-constraint issues, the company said. In a separate announcement, Epson unveiled its new high performance forced guidance system, called Force Guide. Powered by the company’s Quartz technology and sensors, it works with all Epson robots, except the T series, allowing them to sense and make moves using force feedback data. It can detect six axes of force down to 0.1 N,delivering fast, tactile feedback to guide robots for high-precision parts placement. Designed for easy configuration and set up, Force Guide features a point-and-click interface with pre-configured solutions and built-in objects, reducing the development time for applications which require high precision. “Force Guide is a revolutionary force control system that is opening up possibilities for robot automation in areas that were not possible before,” saidBrunnick.It is perfect for tasks such as part insertion,screw driving, grinding/polishing and more. For example, if a pin needed to be placed inside a hole, Force Guide can “feel” its way in, probing with force sensing that is incredibly light so that it can work with delicate parts. It can also be used for things like polishing by training it to hold to a surface even around a contour. “Instead of a closed loop on position, it’s a closed loop on force,” Brookshire said.